Jer 16:14-16: “'Therefore see, the days are coming,' declares Yahuah, when it is no longer said, ‘Yahuahlives who brought up the children of Yisharal from the land of Mitsrayim,’ but, ‘Yahuah lives who brought up the children of Yisharal from the land of the north and from all the lands where He had driven them.’ For I shall bring them back into their land I gave to their fathers. 'See, I am sending for many fishermen,' declares Yahuah, 'and they shall fish them. And after that I shall send for many hunters, and they shall hunt them from every mountain and every hill, and out of the holes of the rocks.'" Jer (YirmeYahu) 23:3-8: “Therefore I shall gather the remnant of My flock out of all the lands where I have driven them, and shall bring them back to their fold. And they shall bear and increase. And I shall raise up shepherds over them, and they shall feed them. And they shall fear no more, nor be discouraged, nor shall they be lacking, declares Yahuah. See, the days are coming,” declares Yahuah, “when I shall raise for Daud a Branch of righteousness, and a Sovereign shall reign and act wisely, and shall do right-ruling and righteousness in the earth. Yahuah appeared to me from afar, saying, “I have loved you with an everlasting love, therefore I shall draw you with kindness. I am going to build you again. And you shall be rebuilt, O maiden of Yisharal! Again you shall take up your tambourines, and go forth in the dances of those who rejoice. Again you shall plant vines on the mountains of Shomeron (popularized, “Samaria,” the area of the “Samaritans”, or ten northern tribes; Afraim was the dominant tribe over them). The planters shall plant and treat them as common. See, I am bringing them from the land of the north, and shall gather them from the ends of the earth, among them the blind and the lame, those with child and those in labor, together – a great assembly returning here. With weeping they shall come, and with their prayers I bring them. I shall make them walk by rivers of waters, in a straight way in which they do not stumble. For I shall be a Father to Yisharal, and Afraim – he is My first-born. For Yahuah shall ransom YaAqob and redeem him from the hand of one stronger than he. And they shall come in and shall sing on the height of Tsiyon, and stream to the goodness of Yahuah, for grain and for new wine and for oil, and for the young of the flock and the herd. And their being shall be like a well-watered garden, and never languish again. and shall fill the being of the priests with fatness. And My people shall be satisfied with My goodness,” declares Yahuah. Thus said Yahuah, “Hold back your voice from weeping, and your eyes from tears, for there is a reward for your work,” declares Yahuah, “and they shall return from the land of the enemy. And there is expectancy for your latter end,” declares Yahuah, “and your children shall return to their own country. Is Afraim a precious son to Me, a child of delights? For though I spoke against him, I still remembered him. That is why My affections were deeply moved for him. I have great compassion for him,” declares Yahuah. Set up signposts, make landmarks; set your heart toward the highway, the way in which you went. Turn back, O maiden of Yisharal, turn back to these cities of yours! And in Yahudah and all its cities farmers and those who journey with flocks, shall dwell together. At this I awoke and looked around, and my sleep was sweet to me. See, the days are coming,” declares Yahuah, “that I shall sow the house of Yisharal and the house of Yahudah with the seed of man and the seed of beast. And it shall be, that as I have watched over them to pluck up, and to break down, and to throw down, and to destroy, and to afflict, so I shall watch over them to build and to plant,” declares Yahuah. But each one shall die for his own crookedness – whoever eats sour grapes, his teeth shall be blunted. See, the days are coming,” declares Yahuah, “when I shall make a new Covenant with the house of Yisharal and with the house of Yahudah, not like the Covenant I made with their fathers in the day when I took them by the hand to bring them out of the land of Mitsrayim, My Covenant which they broke, though I was a husband to them,” declares Yahuah. For this is the Covenant I shall make with the house of Yisharal after those days, declares Yahuah: I shall put My Torah in their inward parts, and write it on their hearts. And I shall be their Alahim, and they shall be My people. Thus said Yahuah, “If the heavens above could be measured, and the foundations of the earth searched out beneath, I would also cast off all the seed of Yisharal for all that they have done,” declares Yahuah. See, the days are coming,” declares Yahuah, “that the city shall be built for Yahuah from the Tower of Kananal to the Corner Gate. And the measuring line shall again extend straight ahead to the hill Gareb, then it shall turn toward Goah. Jer 3:14-18: “Return, O backsliding children,” declares Yahuah, “for I shall rule over you, and shall take you, one from a city and two from a clan, and shall bring you to Tsiyon. And I shall give you shepherds according to My heart, and they shall feed you with knowledge and understanding. And it shall be, when you have increased, and shall bear fruit in the land in those days,” declares Yahuah, “that they no longer say, ‘The ark of the Covenant of Yahuah.’ Neither would it come to heart, nor would they remember it, nor would they visit it, nor would it be made again. At that time Yerushalayim shall be called the throne of Yahuah, and all the nations shall be gathered to it, to the Name of Yahuah, to Yerushalayim, and no longer walk after the stubbornness of their evil heart. In those days the house of Yahudah shall go to the house of Yisharal, and they shall come together out of the land of the north to the land that I have given as an inheritance to your fathers. There is a difference in the sealed and re-gathered tribes of Israel when we compare Rev. 7:4-8, and Ez 48:30-35. By looking into these details, Yahuah is preparing us for the Second Exodus, and the work ahead during the Great Trib (distress). The First Exodus involved serious distress for the unprotected Egyptians, because Yahuah made a distinction (a type of sealing for protection) between “My people and your people.” They were protected from the worst plague of all by their obedience in marking their doors at the first Pesach (Passover). Likewise, there will be variousplagues during the Great Trib (distress), but the people sealed prior to the Second Exodus will have the “distinction” of the Name, Yahuah, and be restored and living in Yahusha’s Covenant. In the First Exodus, the distinction between the Israelites in Goshen and the rest of the Egyptians caused those receiving the plagues to pay attention to those who were protected, as it will also be for us of the Second Exodus. Exo 8:22, 23: “And in that day I shall separate the land of Goshen, in which My people dwell, that no swarms of flies shall be there, so that you know that I am Yahuah in the midst of the land. In the sealing (for protection during the distress) Dan and Afraim are not mentioned, so the major portion of those descended from these 2 tribes are not protected from the plagues during the Great Trib. Yusef’s descendants would include both Afraim and Menashah, however since Yusef and Menashah are listed as sealed, there must be someportion of Afraim with a resistance to receiving the Name. Moreover, Yusef may have had other sons, and though they are not mentioned in the blessing, they may exist, and receive the Name prior to the Great Tribulation. Pro 18:10: “The Name of Yahuah is a strong tower; The righteous run into it and are safe. At Rev 7, Dan and Afraim are not listed as being sealed (for protection). 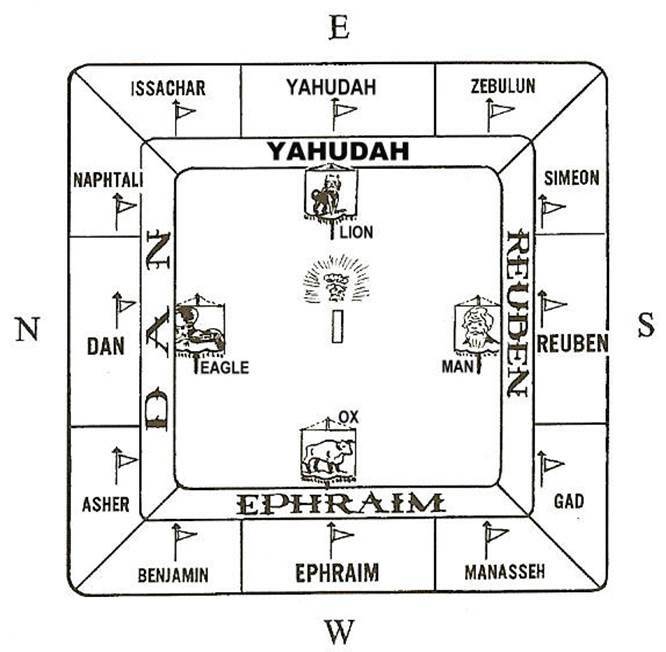 Eze 48:31-35: “The three gates northward: one gate for Reuben, one gate for Yahudah, one gate for Lui. And on the east side, four thousand five hundred cubits, three gates: one gate for Yusef, one gate for Binyamin, one gate for Dan. And on the south side, measuring four thousand five hundred cubits, three gates: one gate for Shimon, one gate forYissaskar, one gate for Zebulon. And on the west side, four thousand five hundred cubits with their three gates: one gate for Gad, one gate for Asher, one gate for Naphtali. All around: eighteen thousand cubits. On the Day of Yahuah, all men’s traditions and positions of authority will vanish completely by the fiery judgment of this world. Yahusha will send forth His messengers to gather His obedient ones who are waiting for Him. (see YashaYahu 25:9) This is the Second Exodus. This will come quickly in a flash at the second coming of Yahusha. Babel’s reign (the beast) will fall, and the reign of Yahusha will begin, and remain forever. It will be the end of the world for Babel, but the beginning for those in the Covenant, sealed by the Name of Yahusha. The world is overtaken by religious traditions. Yunah (Jonah) didn’t go to Nineveh to warn them to live by men’s traditions, but to stop their behavior and turn to Yahuah. When Yahusha comes back, the reign of Babel will be swept away. No one will be saying, “what’s your sign?” They will say, “I having a birthday party, can you come to it?” There will be no more Christmas, Santa, tree-decorating, wreath-hanging, Easter bunny, colored eggs, Valentines Day hearts with arrows, tooth fairy, Halloween, rabbis, gurus, abortions, Muslim fires, idols to bow down to, Ouija boards, Tarot cards, circumambulation, kissing toes on statues, gay pride parades, or any other arrogant nonsense. 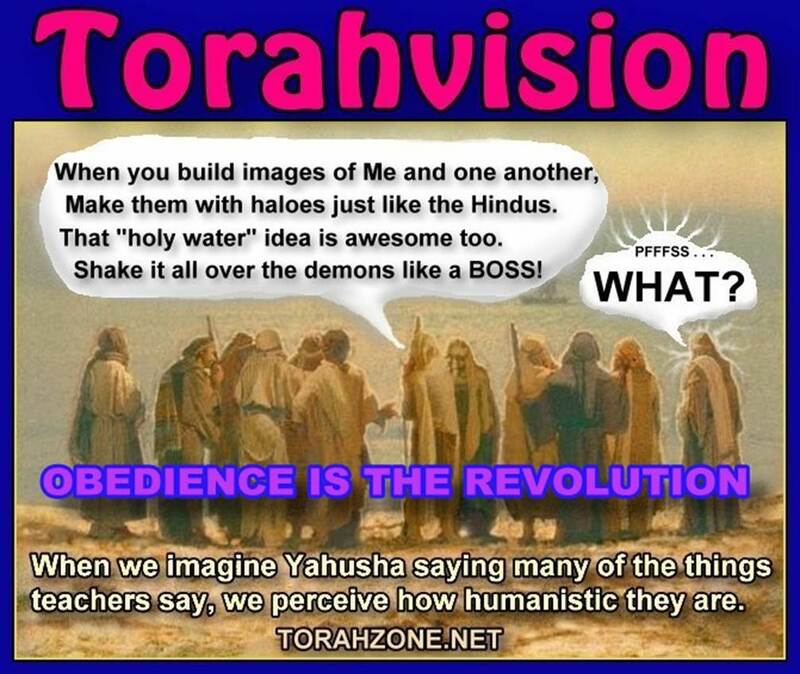 Yahusha wants us to stop the nonsense and learn His Covenant. Repent, or perish - The Day of Yahuah is coming! 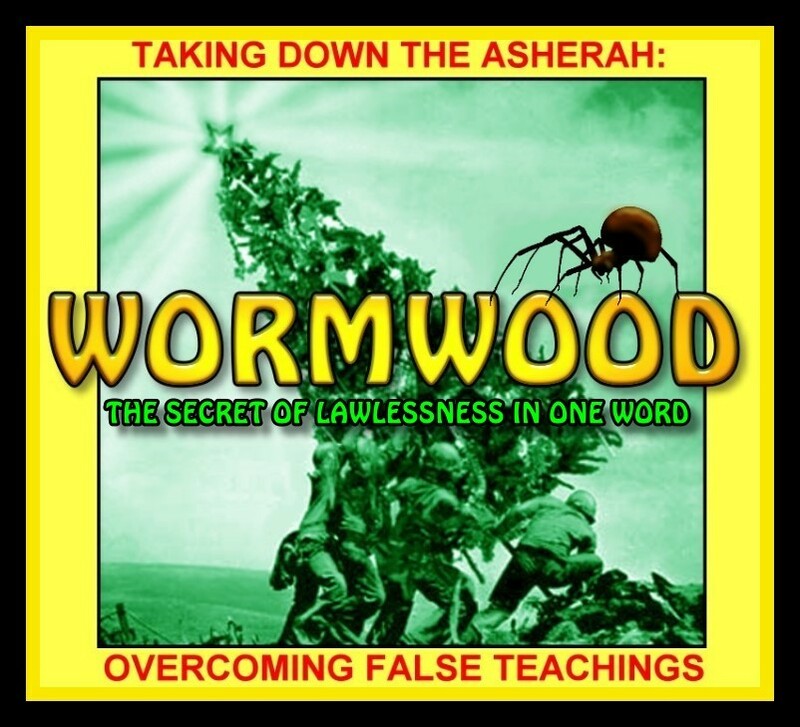 Yahusha’s Word will never pass away, but men’s words are like chaff the wind blows away.